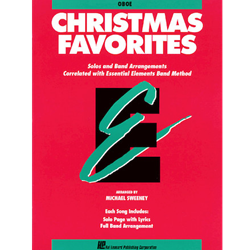 A collection of Christmas arrangements which can be played by full band or by individual soloists with optional CD or tape accompaniment. Each song is correlated with a specific page in the Essential Elements Method Books. Includes: Jingle Bells · We Wish You a Merry Christmas · The Chanukkah Song · Rudolph, the Red-Nosed Reindeer · and many more!